Elevation Design dress worn at World and North American Championships by an Open Champion level dancer. 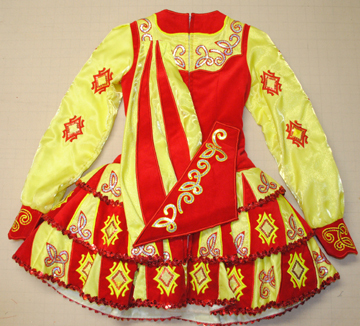 Sadly outgrown – this dress is a stand-out on stage with a unique color combination not found in many dresses – has received many compliments! 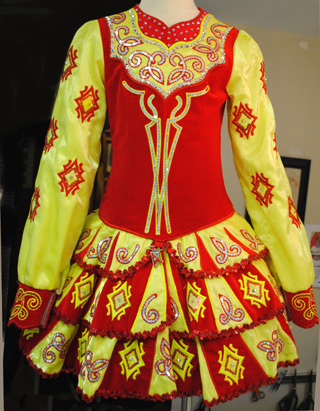 The bodice is fire engine red velvet and accented with “highlighter yellow” shimmer fabric with silver sequins. 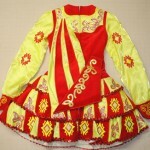 It has hundreds of Swarovski crystals on the bodice, sleeves and skirt. Also included is a custom-made crystal headband.The dress has been well-cared for in a smoke-free home. Asking Price: $US975. Shipping costs are not included in the asking price. Will accept returns and refund the cost of the dress, buyer to pay all shipping costs.